Waterless Grooming Foam available in Green Tea Leaf Essence, and Hypo-Allergenic Fragrance-Free formulas. 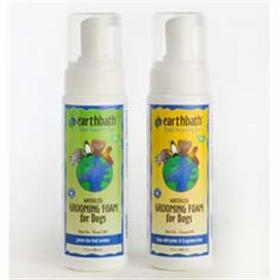 Both formulas are flea treatment compatible and safe for dogs over 6 weeks. No parabens, phosphates, pthalates, DEA, synthetic dyes or perfumes. Any residue left behind is completely safe and will not harm your pet. Foam sprayed on a Huggies wipe is making my long hairy border collie easier to clean up. I love the smell . And it is not sticky. Love the sales on this product. with the cold winter, I wasn't able to wash my dog often, I did some research and I found this product. It's awesome, there is no need of water. great product!!! !